Bangkok isn’t actually called Bangkok. “Bangkok” is the short version – the city’s ceremonial name is “Krung Thep Mahanakhon Amon Rattanakosin Mahinthara Yuthaya Mahadilok Phop Noppharat Ratchathani Burirom Udomratchaniwet Mahasathan Amon Piman Awatan Sathit Sakkathattiya Witsanukam Prasit”. This also means Bangkok currently holds the Guinness World Record for having the longest name of a place. 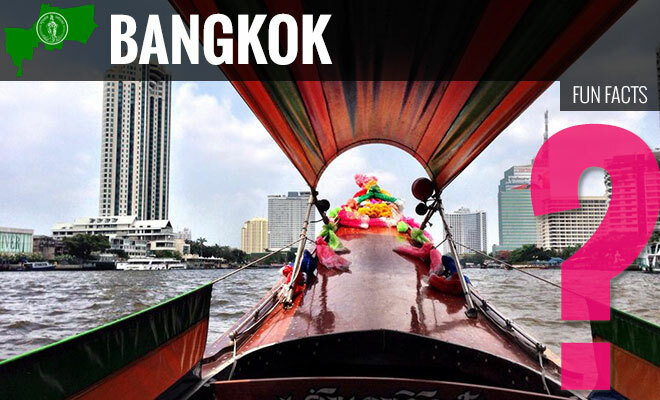 Bangkok was once crisscrossed by dozens of canals or “khlongs”, and its buildings stood on stilts, earning it the nickname Venice of the East. Most of the canals have now been filled or built over. Bangkok’s skyline is speckled with stunning temples, but none quite like the Shrine of Goddess Tubtim, which stands on the grounds of the Swissotel Nai Lert Hotel in the heart of the city. 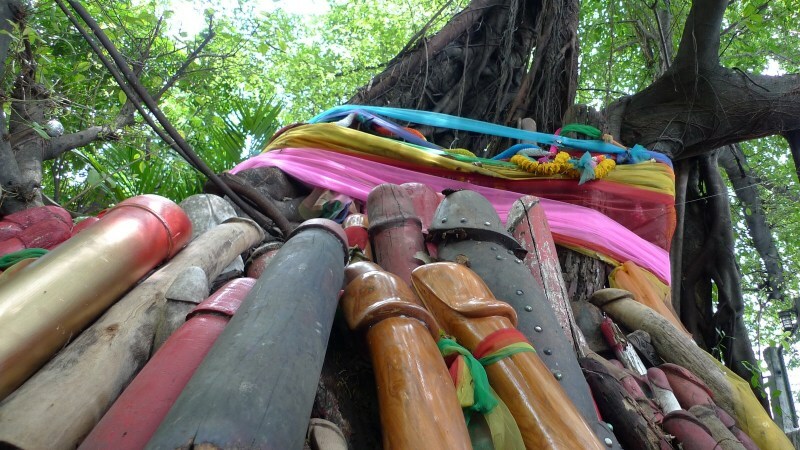 Literally hundreds of penises – from small wooden carvings to big stone sculptures that stand ten feet tall and decorated with ribbons – make this shrine unique. Women visit this shrine when they are trying to conceive, leaving offerings of lotus and jasmine, and if rumors can be believed the shrine has a good success rate. Candy-coloured taxis and tuktuks might look fun and sound cheap, but beware. Taxis will try to avoid using the meter and quote you a price that might sound like a great price, but in all likeliness you are probably being quoted double meter amount. As for tuktuks, that 30 baht (US$1) for a half day tour of the temples might sound like the bargain of the century but you are likely walking straight into a trap. Your driver will insist on taking you to see his “brother” or “cousin” who is a tailor or gemstone merchant, where you will invariably be ripped off and your driver earn a generous commission. 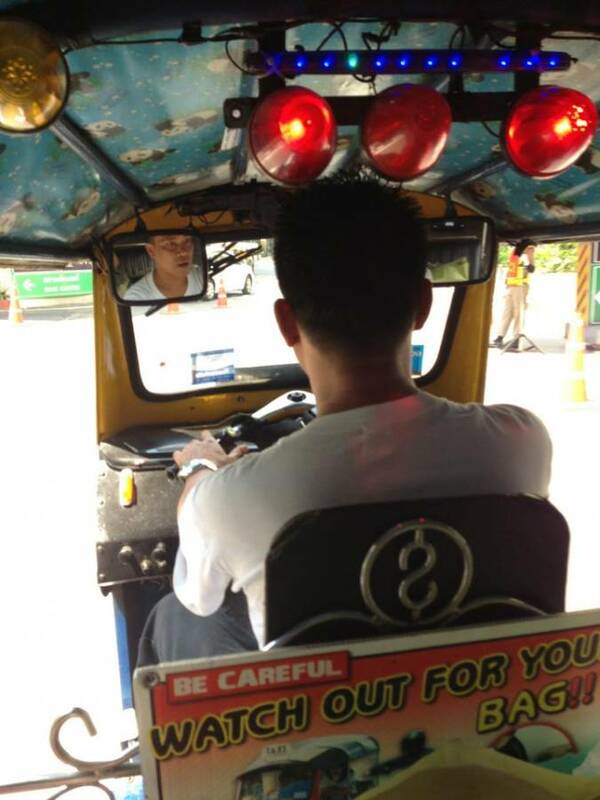 Oh, and there are no seat belts in taxis or tuktuks, so hang on for dear life. Or better yet, take public transport and walk. Dual pricing (Thai price and Foreigner price) has long been a subject of controversy among expats. The majority of tourists don’t realise two price levels exist; despite the fun of haggling the price and taking home what appears to be a bargain, however they probably paid a third more than the locals. As an Australian living in Bangkok, it would be natural to assume Marissa is one of the many glampackers that discovered Thailand's silky sands, crystal clear waters and abundance of knock-off handbags and decided to never leave. As much as she sometimes wishes her life in Thailand resembled something similar to The Beach (oh, Leo! ), Marissa took an out-of-the-blue opportunity to further her professional PR career with one of the world's leading strategic communications agencies in March 2013 and hasn't looked back. Marissa envisages her career and the abundance of international flights in and out of Bangkok will keep her there for the foreseeable future. And the Pad Thai is pretty good too.